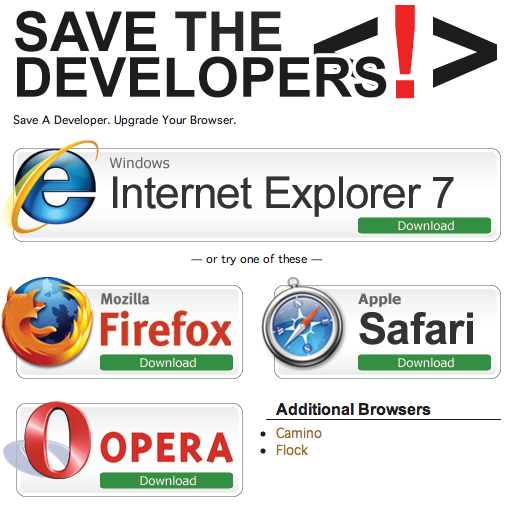 Dropping IE6: No more IE6 support, appeal from Webmasters Revolution. Today Youtube make campaign against IE6 browser. But before Youtube, it was every Webdesign Companies, Every Web development companies that was made tired of IE6 bugs. But today is the end!!! The end of Wasted time!!! I ASK TO EVERY "WEB PEOPLE" to make the revolution against IE6 (Like Youtube). At the World level we will live in a real Better Place.